Great buy on this beach Condo in Virginia Beach. Located just a short walk or bike ride to the boardwalk, this 900 sq.ft condo is neat as a pin. With 2 br 2 bath, balcony, community pool; this little condo makes the perfect weekend get-a-way or great little condo for beach style year round living. Easy walk to Beach Garden Park, grocery shopping, great restaurants, Little Theater of Virginia Beach, The Contemporary Art Center of Virginia and the Va. Beach Convention Center. Start Living the Coastal Lifestyle Today. Specializing in the cities of Virginia Beach and Norfolk, but also serving the cities of Chesapeake, Portsmouth, Suffolk, Hampton and Newport News and Cape Charles on Virginia’s Eastern Shore. All commonly referred to as Hampton Roads. 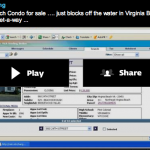 Pingback: Condo for Sale — 860 24th St Virginia Beach Va — Walk to the Beach | VaBeachin …. Living the Coastal Lifestyle …..